A charming little stunt racing game with a slick cartoon style, Dream Track Nation's track creation and sharing community is where Chillingo's latest laps the competition. The play, create, share concept Sony established for community-powered games like LittleBigPlanet and ModNation Racers is alive and well on iOS. Developer PowPow has infused Dream Track Nation with the spirit of those titles, delivering a title that's entertaining enough on its own, but better once you start delving deeper. Even without touching the game's creation tools or browsing the fresh tracks already uploaded by eager community members, Dream Track Nation is a solid little title. 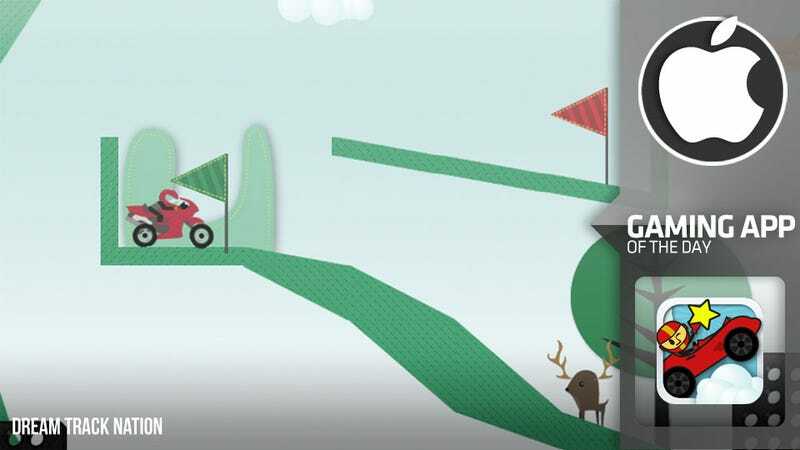 The player is tasked with driving around twisting, looping tracks littered with obstacles and power-ups, collecting the stars necessary to unlock the next track. A set of onscreen pedals handle moving forward and backwards, while giving the iPhone a tilt will help the vehicle right itself after a tumble. The game's three "worlds" — Texas, Alaska and New York — each contain 16 challenging tracks, providing plenty of gameplay for the $.99 asking price. There's even online one-on-one multiplayer racing for those not satisfied with simply beating the computer. But the real value of Dream Track Nation lies beyond the confines of the premade courses. A simple-to-use track editor lets even the most novice builder combine quilted track segments into a passable course. All that's required is a starting flag, a finish line, and a collectible star to make it all worthwhile. Once finished builders can instantly share their creations with the Dream Track Nation community. Players can browse the community in various ways (top rated, new, recently updated), downloading them at the touch of a button. So far community tracks are a mixed bag, but that's what happens when you give players free reign. I've played some excellent courses, like the 42-star "Proving Grounds", and then I played "Neverending Circle", which is pretty much what you'd expect. I urge anyone that does download the game to use the rating system early and often. With some community policing and a heaping helping of talented creators, Dream Track Nation has the potential to become a community-powered beast of a racing game. Hit up the link below to get in on the ground floor.